Hindi film music plays a supporting character in Ritesh Batra’s Photograph, which is a tentative love story (if it can be called that). This music fills the air around Rafi (Nawazuddin Siddiqui; the character’s name, of course, is no accident). He’s a photographer. He stands at the Gateway of India and takes pictures of visitors, promising that this will make them remember the sun on their face, long after their memories have faded. Back home in his cramped neighbourhood, he shares a room with other migrant workers, all of whom know that his grandmother (who lives in another city) is pressuring him to get married. Rafi wants to convince his grandmother that he’s with someone. As he writes the letter, he wonders what he should call this imaginary girlfriend. Lata Mangeshkar’s title song of Noorie floats over his head. That’s the name. He will call her Noorie. But then, the grandmother (Farrukh Jaffar) announces that she is visiting, and Rafi has to rustle up a flesh-and-blood Noorie. This is a classic Hrishikesh Mukherjee premise, involving frenetic play-acting and a benign kind of deceit. But Ritesh Batra works in a more subdued key. A CA student, Miloni (Sanya Malhotra), agrees to be Rafi’s Noorie, and to no one’s surprise, Rafi begins to fall for this girl from the other side of the tracks, his opposite in every sense: her complexion is lighter, her family is more affluent, and she’s Hindu. Rafi is not the sort of man who can express his feelings, but why worry when his namesake is still on the airwaves? Tumne mujhe dekha… becomes Rafi’s anthem. (This is probably accidental, but how lovely that Miloni’s character arc is shaped by a Hindu playback singer and Rafi’s by a Muslim.) The song suits him. It’s a love song, but it’s tinged with melancholy. The film has been garnering rave reviews in the foreign press. 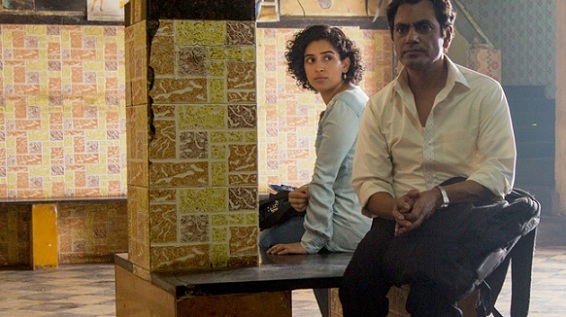 I did like Lunchbox, and Nawazuddin is always a delight to watch. I’ve also been rather impressed with what little I have seen of Sanya, so I’m looking forward to its theatrical release. Gully Boy releases here tomorrow, and while I’m not a great fan of either Hip Hop or Rap, I’ll watch this for Ranveer, Alia, and Kalki, all of whom I really like. Sir, she found herself happier and more beautiful in the photograph. That’s why she agreed to be around the photographer. Sir, I think the movie didn’t have major tonal variations because it was reflecting the leads’ monotonous lives. Rafi was working hard to pay off home loan. Miloni was engrossed in studies and was trying to meet her parents’ expectations. Both of them had forgotten to enjoy, and that’s what Rafi’s grandmother was pointing out when she gave the example of a grimmer past. Yet, there were minor tonal variations throughout, like the drinking sessions, or sizing up of Rafi by taxi drivers, or personification of fan, etc. I felt differently about that, sir. I could have enjoyed the movie even if the grandmother scenes occured off-screen. There was so much chemistry between Sanya and Nawazuddin that I won’t have minded just looking at their stretches again and again.